Medaka Kurokami (黒神 めだか, Kurokami Medaka) is the female protagonist of the series Medaka Box. A freshman of Class 13, she was the 98th and later 99th Student Council president of Hakoniwa Academy. She is a childhood friend of Zenkichi Hitoyoshi, who she strong-arms into joining the Student Council at the start of the series. After becoming the head of the Kurokami Group, Medaka also becomes the chairwoman of Hakoniwa Academy. She is the child of Kajiki Kurokami and Hato Tsurubami, and the younger sister of Kujira Kurokami and Maguro Kurokami. Powers and Abilities: Superhuman Physical Characteristics, Enhanced Senses, Accelerated Development, Supernatural Luck (All abnormals have this to an extent, and Medaka exceeds most by a large margin), Electricity Manipulation (She is able to send and receive electrical signals), Mind Manipulation, Mind Reading, Invisibility, Regeneration (At least Low-Mid. Could regenerate after having a hand thrust into her heart and having every bone in her body instantly broken), Disease Manipulation, Forcefield Creation, Instinctive Reaction, Immortality (Type 2 and 3), Afterimage Creation, Heat Manipulation, Fire Manipulation, Ice Manipulation, Sound Manipulation (Can manipulate sound vibration to alter her own blood flow), Vibration Manipulation (Can accurately control vibrations from her own attacks and, after becoming a language user, she can also manipulate sound vibration), Blood Manipulation, Likely Plant Manipulation, Causality Manipulation (Can erase causes and effects with All Fiction), Automatic Resurrection (Can resurrect herself with All Fiction), (Can erase her own death with All Fiction), Transformation, Can deny aspects of reality and turn them into "fiction", thus rendering them non-existent with All Fiction, Can transfer negative effects from herself to another location instantly, Power Nullification, Statistics Reduction and possibly Durability Negation with Book Maker (Able to negate and bring certain powers down to her level. Her usage of it is also likely better than Misogi Kumagawa's), Can instantly copy and perfect any supernatural ability or physical feat she sees or hears about and perfectly internalize any information she receives with The End, Statistics Amplification (Increases in power relative to the number of her opponents with More Than Group), Precognition (Has a "Know Dangers Before They Happen But In Return You Can’t Avoid Them Skill"), Creation (Can create slopes, footprints, wines, and possibly a universe with various skills), Weather Manipulation (Can clear typhoons with Impro Time), Weapon Mastery (Her Sworder skill allows her to use both swords and guns at the same time), Possibly Pocket Reality Manipulation (Her Pioneer Flag power is a "Create Universe Skill", though the size of this universe or the details of its creation are not clear), Resistance to Mind Manipulation (Can counter Mind Control by brainwashing herself back to normal, immune to electricity-based Mind Manipulation), Resistance to Sealing, Resistance to Empathic Manipulation (Can use Ice Fire to keep her head cool to prevent suffering from mental damage) and hot and cold temperatures (By controlling her own body temperature via Ice Fire), Resistance to Word Manipulation (only while in War God Mode), Minor Resistance to Memory Manipulation, Likely Resistance to Power Erasure (Only for Minus abilities), Resistance to Power Absorption (Oudo Miyakonojou couldn't take away her abilities), Can control machines, Master Hand-to-Hand combatant, Can likely corrode anything she touches, Can reopen any physical or mental wound, Possibly Power Absorption (Can steal other's power by touching their heart), Memory Manipulation (Can erase other's memories about her with Mister Unknown and All Fiction is capable of Erasing memories), Perception Manipulation (Mister Unknown hides the user from the opponent's senses), Durability Negation, Word Manipulation, possibly many others. Durability: At least City Block level (Took multiple hits from both base and theme song Hinokage. Comparable to Kumagawa) | At least City Block level | Unknown, at least City Block level | Unknown, at least City Block level | Unknown (Also, Immortality, Regeneration, All Fiction and The Encounter make her virtually impossible to kill). Stamina: Infinite, after copying Oudo's abnormalities, she should similarly have an inexhaustible power supply. Standard Equipment: A variety of hidden weapons thanks to hidden weapon technique (which includes knives, katanas, staves, grenades, guns and a bazooka), possibly Unzen's rumble balls. Intelligence: Genius in problem solving. Extraordinary Genius in learning new information. By the end of the series, she also has a Counting Skill and a No Miscalculations Skill, though the details of these skills are unknown. Advanced Growth Rate: Medaka is incredibly gifted. By the time she was six months old, she had matured much more than her older siblings, progressing through infancy at an accelerated rate. Nobody was capable of teaching her anything because she could perfectly; learn, memorize, recall, understand, master, and utilize anything and any skill by experiencing or observing it, within seconds. She has a limitless capacity for learning and growth. Superhuman Physiology: Medaka naturally possesses a bevy of superhuman skills: adaptability, agility, analysis, awareness, balance, calculation, charisma, cognition, combat, competence, coordination, deduction, dexterity, durability, eloquence, endurance, flexibility, instinct, intelligence, intuition, leadership, memory, meta-luck, mimicry, perception, persuasion, reasoning, reflexes, regeneration, senses, speed, strength, tactics, vitality, and willpower. Inhuman feats include: balancing on a small arm water wing, destroying a school building while constricted by tiny wires, and quickly moving three members of the Student Council into lockers in seconds before a giant explosion occurred. Although she rarely uses this skill, she possesses an ability called body supremacy; she is capable of near complete, precise control of the movements and functions of all her muscles, bones, flesh, blood, organs, nerves, hair, and veins, and she can control them with both conscious and/or subconscious command. This makes her immune to forced motor control by others and allows her to adjust or improve body functions. Intimidator/Alpha Presence (動物避け, Doubutsuyoke): Medaka's raw power, which humans perceive as either as a supernatural charisma and eloquence which inspires them to follow her, or as an overwhelming fearful aura that forces them to obey her. This raw power when sensed by animals inspires only pure terror. Thus, although Medaka adores animals, they in turn are frightened to death of her and will avoid contact at all costs. Revised Echolocation Cannon Echo Counter Cannon (声帯砲改 声対砲, Seitaihouaratame Seitaihou): A powerful shout, it vibrates on a reverse phase that cancels out other sounds. Combat Expert: Medaka is a Red Belt in Judo and is highly skilled in Kendo (even thought she just "tried her hand" at it). Using only the basics of what is taught, she could do the Replication Technique (stepping forwards and backwards so fast that she creates clones of herself) and steal things out of peoples hands without anyone noticing (bare hand disarm). Medaka has also learned to catch bullets in her mouth as a form of self-defense. Kurokami Rolling Savate (黒神ローリングソバット, Kurokami Rōringu Sobatto): Medaka performs a Savate style reverse figure kick to the opponent's face. Kurokami Lariat (黒神ラリアット, Kurokami Rariatto): Medaka strikes her opponent's neck with the inside of her outstretched arm. Kurokami Climb (黒神クライム, Kurokami Kuraimu): Using Yoshinogari's claws and Isahaya's spikes, Medaka can scale building walls as high as the fifth floor. Medaka doesn't seem to have much control over her momentum however, as she reached the fifth floor while only intending to climb to the third. This may have been because she was in a hurry however. Kurokami Dancing (黒神ダンシング, Kurokami Danshingu): Using Kunisaki's bicycle, Medaka can quickly maneuver around multiple people, even while moving up a staircase. Because of how quickly she moves, Medaka needs to tie up her hair before beginning. Kurokami Reflect (黒神リフレクト, Kurokami Refurekuto): Borrowing Unzen's Super Balls, Medaka unleashes a barrage of attacks from several angles at amazing speed. However, Medaka claims that the angles are completely random, as she lacks Unzen's calculation abilities, at least for the quantity of balls she uses to attack. The actual effectiveness of this attack is unknown, as her opponent, Takachiho, was able to dodge every single ball. Kurokami Open Blow (黒神オープンブロー, Kurokami Ōpun Burō): In War God Mode, Medaka charges forward and attacks with a palm strike. The hit packs enough force to knock back Tsurubami, and caused him to spit up blood. Kurokami Hip Attack (黒神ヒップアタック, Kurokami Hippu Atakku): While her body is being restrained, Medaka lifts herself with her stomach muscles, then drops herself on her opponent's chest with enough force to make them cough up blood. Medaka labels this as a "girly" attack. Kurokami Phantom (黒神ファントム, Kurokami Fantomu): Medaka's signature move, she first jumps up and down, dragging out the noise so that the sound of her feet tapping on the floor isn't heard until after her feet have left the floor again. Once the sound lag is at its fullest, Medaka blows forward, producing a sonic boom that destroys everything in her front of and behind her. Because she moves faster than the eye can see, the opponent won't be able to react until after she has already hit them. Takachiho, so far the only person she has used it on, theorizes that she is faster then light, but Medaka claims that she just speed forward when he blinked. The aim of Kurokami Phantom is to forcefully break through the sound barrier. Kurokami Phantom: Proper Version (黒神ファントム ちゃんとした版, Kurokami Fantomu Chantoshitahan): After witnessing Hinokage's Theme Song, Medaka becomes capable of using Kurokami Phantom without any physical strain or damage. However, to use the Proper Version, Medaka must be in Altered God Mode and can only use it three times in one day. The aim of the Proper Version is to, instead of break the sound barrier, work with it in order to create a less self-harmful attack. Kurokami Final (黒神ファイナル, Kurokami Fainaru): Kurokami Phantom's final form, only usable after Medaka enters End God Mode, wherein her blood flow is greatly enhanced through the use of vibrations. To use this technique, Medaka first creates a shadow clone in front of her in order to break the sound barrier without losing any of her own speed or power. Afterwards, she follows the slip stream created by the clone. Kurokami Final utilizes blind spots; Medaka hides within her opponent's shadow while optimizing her speed. In the case of Iihiko, who dodged the attack, Medaka made a U-turn and attacked him from behind. Auto-Pilot: An Abnormality copied from Takachiho that allows Medaka to effectively put her brain on auto-pilot, reacting to, dodging, and countering attacks without thinking about it. However, this ability has its limits, as it cannot defend Medaka against things she would be unable to perceive normally. Hidden Weapons Specialist: An Abnormality copied from Munakata that allows Medaka to conceal any weapon of any size on her person, even if its dimensions vastly exceed her own size. Reading Minds: Can read people's minds, or to be exact, can read their emotions. Medaka can receive the electrical signals both machines and people release. This Abnormality is more like a transceiver than actual telepathy. Weighted Words: An Abnormality that allows her to manipulate the electrical signals in one's brain with verbal commands, making it exceedingly difficult to resist them for as long as Medaka remains complete and utter concentrated on her target. This ability also extends to machines, allowing her to crush or lift them by manipulating the electricity inside of them. Five Focus: A Minus that allows Medaka to inflict or remove any diseases she wishes from those she scratches with her nails, ranging from a slight fever to cancer. Encounter: An ability copied from Gagamaru Chougasaki that allows her to push away all damage inflicted on her, including all physical, emotional, and mental damage, elsewhere. No matter how fast or numerous the attacks, she will take no damage from any assault. The location is specified by her and can range from structures to other people. Even if there is no opening, Encounter will still push any damage away. 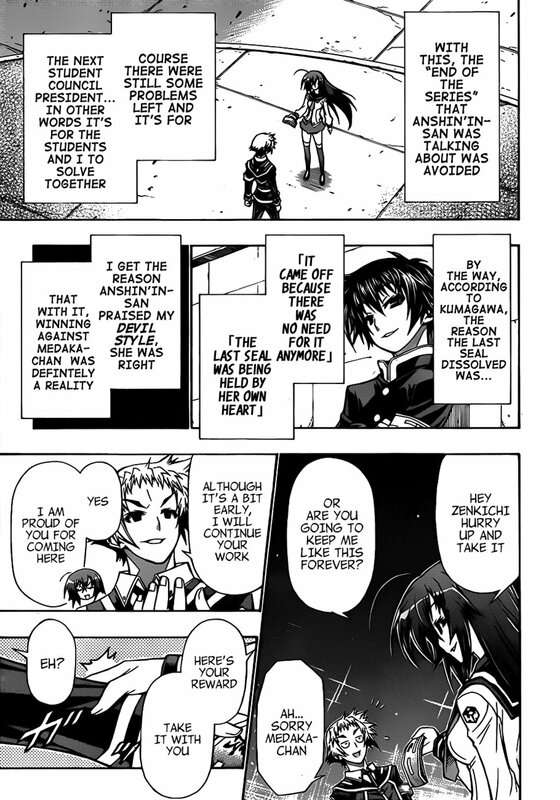 It is also speculated that Encounter would be able to push away Medaka's own death. Scar Dead: A Minus that allows Medaka to reopen any wound someone has ever received, no matter how old the wound is. This ability extends not only to physical wounds, but to mental wounds as well, allowing her to destroy her foes' minds by reopening all of their mental wounds and traumas at once, ignoring their physical durability. Ice Fire: An ability that allows Medaka to manipulate her own body temperature. She can lower her temperature to create and manipulate ice around her using vapor in the air. She can also instantly seal wounds by freezing her veins and skin, and well as keep her head cool to prevent herself suffering from mental damage in the midst of combat. Unknown Hero: An ability copied from Hinokage that prevents Medaka's foes from noticing her presence unless she wills it. Even then, if she wishes herself to remain hidden, no one, not even those as observant as her, will be able to acknowledge her presence. Mother's Task: An Abnormality copied from Hitomi Hitoyoshi that makes Medaka exceedingly skilled at anything considered "motherly", such as gardening, cleaning, and cooking. When applied in combat, Medaka would be able to able to easily tear apart plant life when armed with any set of gardening tools. Book Maker: A Minus copied from Kumagawa, allowing Medaka to impale her foe with a special screw that brings the target's body, spirit, technique, intellect, and talent down to Kumagawa's level. Although the attack itself does virtually no damage, the screw "soils the heart", which can destroy the ambition and drive of most individuals. Given the fact it was copied directly from his arsenal, it should possibly be able to replicate its durability ignoring effects, although this is uncertain. All Fiction: A Minus that allows her to deny aspects of reality; to make anything "nothing". Because of this, she can undo anything that has been damaged. However, it has been stated that once she removes something with her Minus, she cannot return it, as it has become "fiction". This ability can even automatically reverse her own death as well as the death of others. Raff-Rafflesia: A Minus that allows to corrode and dissolve anything she touches. Though her power only works through her hands, it is powerful enough to corrode anything from concrete to the air around her. She can control its intensity, area of effect, and other aspects of it. And a portion of Ajimu's quadrillion skills, of which she has demonstrated one hundred Trample Skills. However, The End does have its limits; Medaka cannot copy feats done through sheer physical ability, only if that feat is achieved through use of a skill, and she is unable to stop herself from learning an Abnormality when she experiences it. Language User (言葉使い, Kotoba Tsukai): After learning the basics of a style, Medaka is able to read an opponent's feelings to automatically counter their attacks, although she can only counter with a punch. Medaka can also use sound to pump her blood and move her muscles after her heart has stopped. On top of increasing her physical characteristics, this has the side-effect of causing her whole body to vibrate, repelling physical contact. Preaching To The Lesser Mortals (上から目線性善説, Uekara Mesen Seizensetsu): Medaka's most well known trump card, she preaches to "pitiful" people who need help. She says out loud her views about them, saying they can be saved and that something horrible must have happened in their pasts for them to have fallen so far in life. Strict Girl/Cute Girl Switch (ツンデレ, Tsundere): Medaka's second trump card, she changes abruptly from her usual personality to a softer attitude, adapting her expression and mannerisms to appear more cute. Over Flowing Love (行き過ぎ愛情表現, Ikisugi Aijouhyougen): Medaka's third trump card; she used it so much in class that almost everyone lost their first kiss to her until Zenkichi put a stop to it when they started elementary school. When using this ability, Medaka first makes her face look cute and then gives a kiss to the other person showing that they are loved. War God Mode (乱神モード, Ranshin Mōdo): Medaka's fourth trump card; when Medaka is enraged, she goes into War God Mode. When in War God Mode, she loses her sense of humanity and goes berserk, while her hair turns a lighter shade of purple (fluorescent red in the anime). 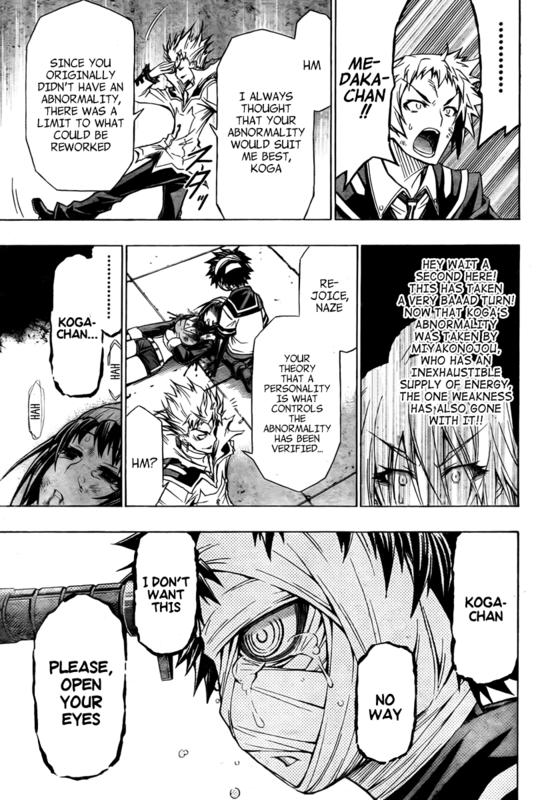 Medaka's presence becomes so ominous and evil that even Abnormals can be unnerved by it. Her physical strength and healing rate both increase drastically, allowing her to deal out devastating attacks while shrugging off horrific injuries. Medaka only assumes War God Mode when her friends are threatened, and even then, only when she is under heavy emotional stress. Amusingly, Medaka will also assume War God Mode when being harassed by Maguro. During her fight with Tsurubami, Medaka gains the ability to enter War God Mode at will, without losing herself to her anger. Because Medaka does not hear words when she is in War God Mode, she becomes immune to the effects of styles when she assumes this state. Altered God Mode (改神モード, Kaishin Mōdo): Altered God Mode is an upgraded version of War God Mode that Medaka achieved by mastering the numerous Abnormalities of the Thirteen Party and attempting to brainwash herself with Oudo's Weighted Words. Unlike War God Mode, she retains her thought process, doesn't go berserk, her hair turns black instead of light purple, and her eyes grow a darker shade of red. In this mode, Medaka is able to control everything about herself, and is capable of overwhelming Oudo and resisting his Unreasonable Taxation. In Altered God Mode, Medaka is also able to use an improved version of Kurokami Phantom that utilizes the speed and power of Hinokage's Theme Song. Though Medaka has mastered this new form, she will still revert to War God Mode if angered enough. Altered God Mode falls under the classification of martial arts, rather than as one of Medaka's skills. Forsaken God Mode (廃神モード, Haishin Mōdo): Created to serve a similar purpose as Kumagawa's Book Maker, Forsaken God Mode makes Medaka weaker than her opponent. No matter how weak her opponent is, Medaka will be weaker than they are; she labels it as an ability that allows her to forget about strength and skills and just go all out. Forsaken God Mode was developed as a byproduct after Medaka's fight against the Minus. With it, Medaka can intentionally make herself weaker so as to better understand people who are weaker than she is. But the aspect of understanding her opponent doesn't exist due to her complete lack of empathy. In this form, Medaka's hair turns completely white, and her eyes become a lighter shade of red. Hybrid God Mode (混神モード, Konshin Mōdo): A combination of Forsaken God Mode and Altered God Mode, Medaka labels this form as "matching strength with weakness". The exact capabilities of this mode are unknown; however, it was useless against Tsurubami's style. In this form, the left side of Medaka's hair turns black, while the right side becomes white. Her right eye also turns a lighter shade of red. End God Mode (終神モード, Shuushin Mōdo): In this form, Medaka's hair turns black and increases in volume drastically. With her increased blood flow, Medaka is able to move at supersonic speeds and create shadow clones in front of her. These clones have enough speed to break the sound barrier, creating a slip stream to remove the obstructions to Medaka's power. Note 1: Regarding the Light Speed Hyperbole, there are only so many statements that could be dismissed as mere hyperbole, but none of then with any contradictions whatsoever. Even narration point to certain characters (5 at the maximum) being lightspeed, with no contradictions at all. In fact Ajimu blowing up the star, the nature of Hinokage's Theme Song, and Medaka destroying the moon overnight only point towards it. Even Iihiko called Medaka's Kurokami Phantom "slow", right before beating her with glasses.